I love anime, cosplay, K-pop, and glam makeup. Grams asked if I'd like to do new page, in addition to my home page, sharing photos of me and some of my favorite memories over these past six years. Would I? Of course I would. So I'm posting a set of pictures every month in 2019. I hope you enjoy them. You can email me about this page at Mya@earthstarworks.com. I would love to hear from you. 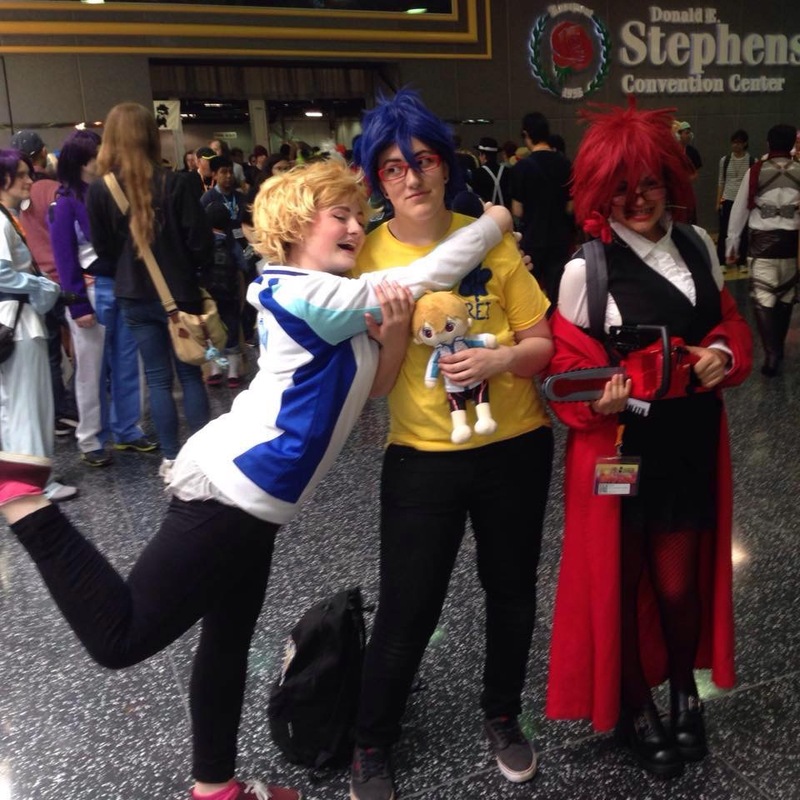 In May of 2015, I again attended ACen (Anime Central) in the Stephens Convention Center at Rosemont's Hyatt Regency O'Hare. There were over 30,000 people there, nearly 1,500 than the year before ... not that I could actually tell. I once again cosplayed as a female - but way more formal - Grell Sutcliff (Gureru Satokurifu), a Black Butler (Kuroshitsuji) Grim Reaper and a transwoman who's still biologically male. At least this time, my wig was styled! Here I am, in full regalia, with Nagisa Hazuki (left) & Rei Ryugazaki (middle), two guys from the swimming anime series Free! The cosplayers were just so cute, especially with that funny little Nagisa doll Rei is holding. 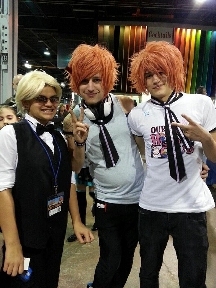 This is me mugging for the camera while meeting two of my cosplay icons: Panda (middle) & Lux (right). Don't you just love all that red, red hair. And they were so cool. This was the beginning for me of a friendship with Lux. 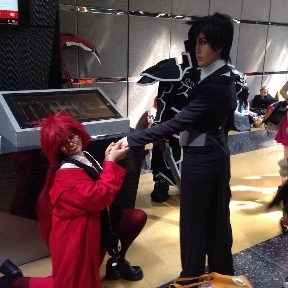 And me making a big, honking deal of proposing to Claude Faustus (Kurodo Fosutasu), aka the demon "Spider Butler" of the Trancy household in Black Butler. Whadaya mean, did he say yes? Who could say no to me? 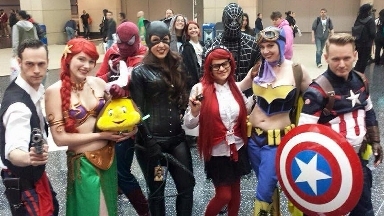 In Spring of 2015, I went on a school field trip to my first ever C2E2 (Chicago Comic & Entertainment Expo), which was held at McCormick Place. There were over 70,000 people there! I cosplayed as a casual Grell Sutcliff (Gureru Satokurifu), one of the Grim Reapers from the Black Butler (Kuroshitsuji) series. Here I am with a bunch of superheroes. Plus Princess Ariel from The Little Mermaid holding her fish friend Flounder (who didn't need to panic with all those superheroes around him). See the two photobombers behind us? He's Magneto (Max Eisen-hardt) from X-Men. When Grams saw this pic, she said, "Hangin' with the bad boyz, huh? That's my #grandMya." And I said, "Yep." 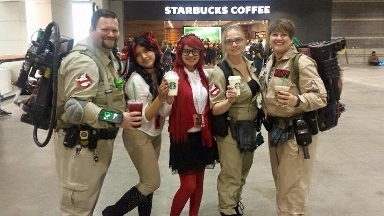 LOL Grabbed some Starbucks with a Ghostbusters crew. Plus one of my classmates, dressed as a cat, who was pawing at my coffee. But I fended her off 'cuz, you know, need all the caffeine possible to survive the day. 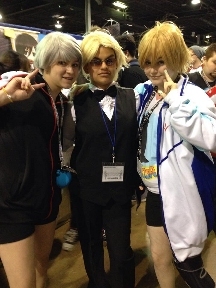 Here are three more photos from my first con at Anime Central, cosplaying as Shizuo Heiwajima from Durarara. My favorite set of "gotta love 'em" twins: Hikaru (elder; right) & Kaoru Hitachiin from Ouran High School Host Club. The cosplayers are not real twins, but that's OK. The cutest swimmers around, from the sports anime about swimming: Free! The character in black is Aiichiro Nitori, the one in white is Nagisa Hazuki. 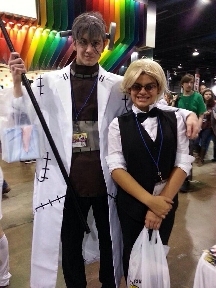 Another tall cosplayer: Mad scientist Franken Stein from Soul Eater, with scythe weapon & a screw through his head that he spins to reset himself 'cuz he's crazy. 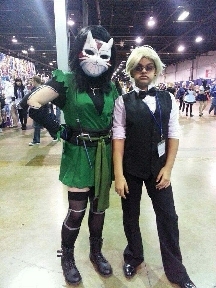 I started cosplaying in 2014, and this was my first convention. 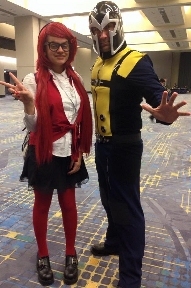 It was Anime Central, in the Donald E. Stephen Convention Center in Rosemont, IL. I was cosplaying as Shizuo Heiwajima from Durarara. I always thought I had to pose serious in this character. It felt fun to be at my first con ever. But my wig was actually a mess and, OMG, crazy. I do look back now and wish I would have styled it better. But we all start out somewhere, and to see how I cosplay now is even better. 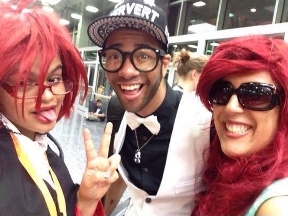 That first con opened a doorway to new friends and more fun cons!! 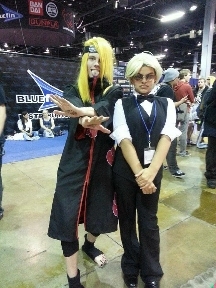 With Deidara from Naruto. Look at that foot. With Cheshire from Young Justice. That's one cool cat. Hey look! 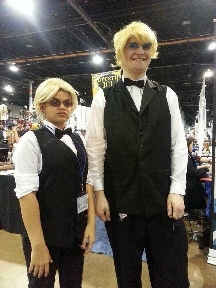 Someone cosplaying the same character as me! !